The Cupertino-based fruit-company announced the next major update – iOS 9 – at the World Wide Developers Conference earlier this month in San Francisco. The new update aims at enhancing the overall user experience offered by its predecessor as well as adding a plethora of new features to witness the next major release. Compared to the predecessor iOS 9 compiles the existing features with more sophisticated code making it less prone to errors, eventually contributing to a more stable release. Some of the newly added features rely heavily on the machine learning algorithms that are made to cut your day’s job. It’s been few days we are using iOS 9. So far it didn’t disappoint us with its performance (apart from few bugs, but plausible because of beta release). 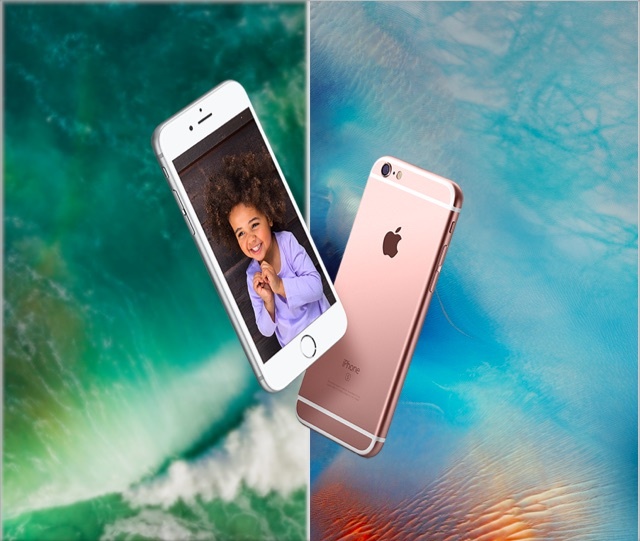 We go in-depth comparing iOS 9 and iOS 8 finding notable changes you must be aware of. Started using iOS 9, the first thing we noticed was the system-wide implementation of the new typeface. Apple replaced the “Helvetica Neue” system font introduced in iOS 7 with “San Francisco” in iOS 9. This change comes after users constant criticism with difficulty in reading with Helvetica. San Francisco is the same font used in Apple Watch (watchOS), offering easier reading experience even on the small screen. San Francisco becomes Apple’s new identity by making its place into OS X, iOS and watchOS as the system font. Apple killed the Newsstand app – which was the part of iOS since 2011 – in iOS 9. A standalone Flipboard killer, called “News” is introduced in iOS 9. The newly introduced app pulls content from The New York Times, the Atlantic, Bon Appetit, and many more publications. The News app hasn’t made its way into the Beta 1 so, we couldn’t actually use it. The Notification Center is tweaked marginally. It now includes a stock widget to show the battery status of iPhone and connected Apple Watch. This stock widget comes pre-installed only on iPhone and not iPad. Additionally, there’s a Find My Friends widget to get quickly sneak peek where your friends are. The screenshot isn’t given here as the battery widget works the best with Apple Watch paired. The App Drawer (recent apps menu) gets redesigned in iOS 9. The Windows Phone like design featured in iOS 8 has been replaced with Android Lollipop like cards, but horizontal. The app cards are now placed on top of each other with their name appearing at the top instead of the bottom (as in iOS 8). The transitions have become a lot smoother. The shortcuts to your recent/favorite contacts introduced in iOS 8 have been obliterated as the app cards have aggrandized, and they use up a majority of the space. 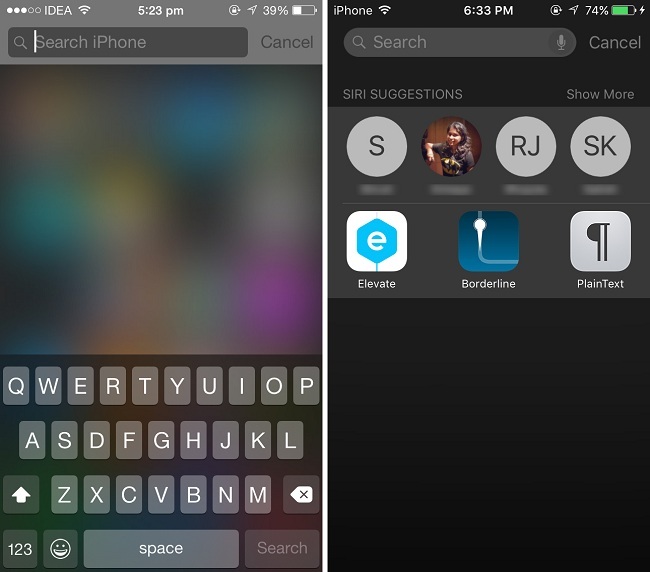 iOS 9 takes the Spotlight Search to a whole new level. The traditional spotlight search has been redesigned with new interface and features. Much like iOS 8, you can access Spotlight Search by swiping down on the home screen. An additional way to access Spotlight Search is by swiping right from the first page of your homescreen (much like pre-iOS 7). The welcome screen of the revamped search isn’t empty and sullen as before. The redesigned screen will be showing “Siri Suggestions” that include contact based on the people you talk the most, your appointments, and your recents. Taking the scope global, you can use Spotlight Search to search for everything from contacts to sports results with results displayed right there. Using your current location, you’ll also be informed about the nearby places and trending news stories from that location. 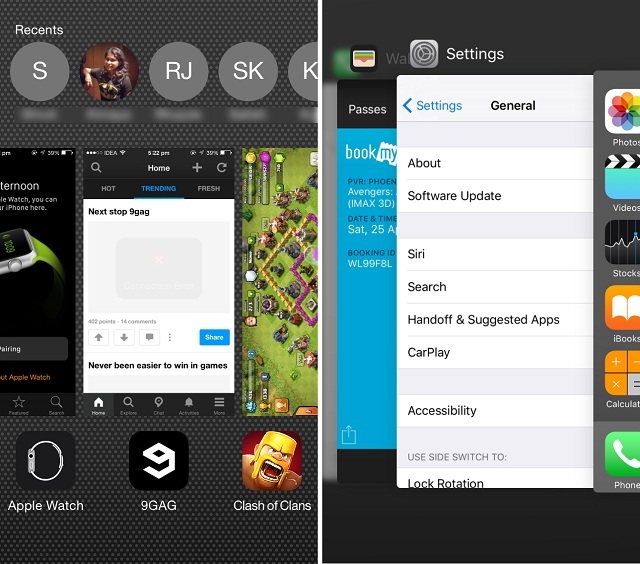 Spotlight will also integrate third-party apps, which will bring almost endless possible searches. Siri is changed aesthetically. From processing animation to the display layout, everything’s changed. But that’s not all, it has a lot more to offer behind the scenes. 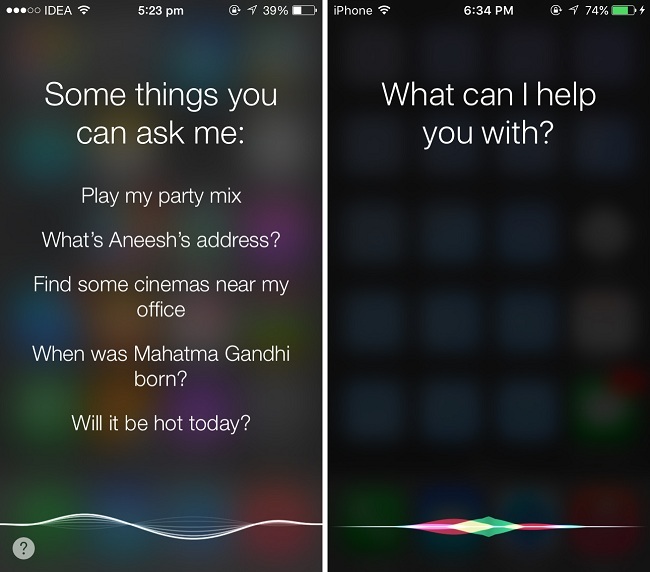 Siri is now forty percent faster in responding to the queries, says Apple. What Siri offers now is the ability to search into your Camera Roll. You can ask Siri to search for your photos based on time and the location it was taken. For example, you want photos shot at Golden Gate Bridge – just say “Show photos from Golden Gate Bridge” which will quickly redirect you the Photos app. Similarly, you can also ask Siri to search for photos by date. Siri has gone too far with app data synchronization. The overlaid personal assistant can be used to create contextual reminders in Safari, Notes and Mail app. For example, suppose you are reading an article in Safari, and you have no time to complete it. In this case, just call Siri and ask “Remind me about this” and it will place a Reminder. It also works while writing in Notes app or Mail app. Additionally, reminders are revamped with the ability to remind you at a specific location. Apple Maps come with Siri integration that offers you the ability to search for transit directions. Limited to fewer cities, you can ask Siri “Get me transit directions from the San Francisco to One Infinite Loop”. All your math equations and conversions can also be handled by Siri (by itself) without the association from WolframAplha. You can directly ask “What is 1024+512”, “Convert 3 inches to meters”, etc. Processing the equations without relying on third-party services has made Siri respond faster to these queries. iOS 9 gets deeper Proactive integration. Proactive Assistant – the company’s attempt to use machine learning to study user patterns and deliver content before it was asked. Although too late, it’s Apple’s answer to Google Now. Proactive is constantly monitoring your habits and learning them. After a point, your phone knows all your habits and starts helping you accordingly. You don’t have to worry about the privacy as your private data will never be compromised, says Apple. Whenever you plug in the earphones, the Proactive will automatically launch music app. If you have the habit of calling someone at certain times, Proactive will start placing their contact in the Search when the appointed hour approaches. Similarly, if you are habitual to browse 9gag before going to bed, you’ll find the app placed in Search so that you can launch it with fewer gestures. If you get a new contact through an email, Proactive will automatically add it to your contacts. Also, if you have planned a meeting through an email, the date, time and venue will be automatically added to your calendar. 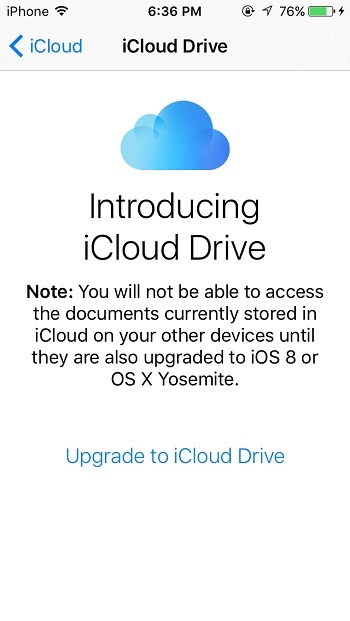 One of the newest addition to iOS 9 is the iCloud Drive app that allows you to access files stored in your iCloud Drive. However, although present, this app is hidden by default. To enable it go to Settings > iCloud > iCloud Drive > Show on Home Screen. Browsing through your files on iCloud Drive wasn’t possible with iOS 8.
iOS 9 introduces a ‘Back’ button that allows you to go back to the search results or previous the app. If you have navigated to a different app through Spotlight search, the “Back to Search” button will appear in the status bar at the top of the screen. Hitting it will get you back to the search results. Similarly, if you decide to respond to a receive a message whilst you are into another app, you’ll go into the messages app to reply and from where you can use the Back button to go back to the previous app which you were using. The Reader Mode in Safari is enhanced with new tweaks aimed at easing the reading experience. 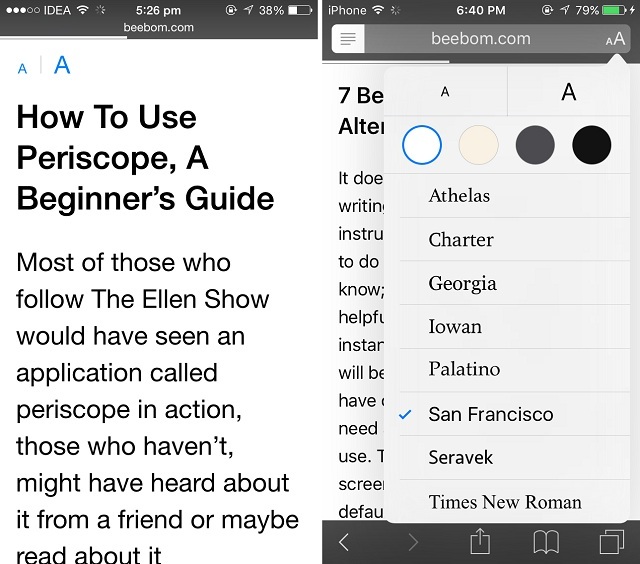 With iOS 9, Safari adds the options to change the font size, the font and the background color in the Reader Mode. iOS 8 only allowed to change the font size. Safari in iOS 9 offers a better reading perspective to the user. 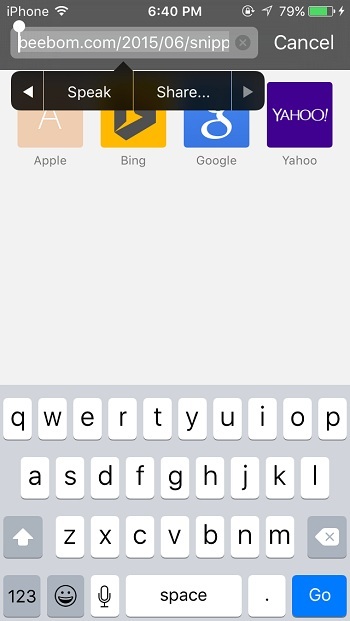 Safari in iOS 9 offers a new way to share URLs. On selecting the link displayed in the address bar or the universal search bar in Safari, you’ll be offered with a “Share” button beside Cut, Copy, and Define. The Share button will open the Share sheet providing easier access to third-party apps for sharing. Safari extends its scope to a special case of extensions for ad blockers. Allowing the developers to develop an app with content blockers, you’ll be able to see a lot of such apps soon. Apps including such extensions will refrain images and scripts from loading in the browser. Safari also lets you upload files directly from the iCloud Drive. Earlier, due to the ecosystem restrictions you were only allowed to upload photos to an online hosting from your camera roll. However, with the integration of iCloud Drive will allow you upload any file directly from iCloud Drive to any online hosting service. 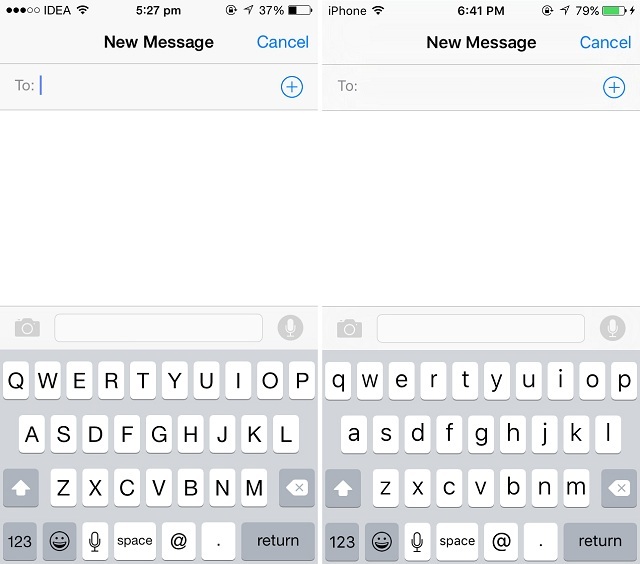 iOS 9 finally adds a lowercase keyboard. Prior to this release, the virtual keyboard displayed capital letters even if you were typing in lowercase. Henceforth, if you haven’t turned on the Shift key, all the keys will be displayed in lowercase. One of the newest addition to iOS 9 is the ability to use your virtual keyboard as a virtual trackpad. By simply moving two fingers on the keyboard, you can use it as a trackpad that comes handy while selecting, editing or moving the text. Apple Maps are gradually improving as iOS proceeds. With iOS 9, Apple Maps have gone too far. Due to heavy criticism in early days, the company is working on improving the user experience and making it less prone to bugs. 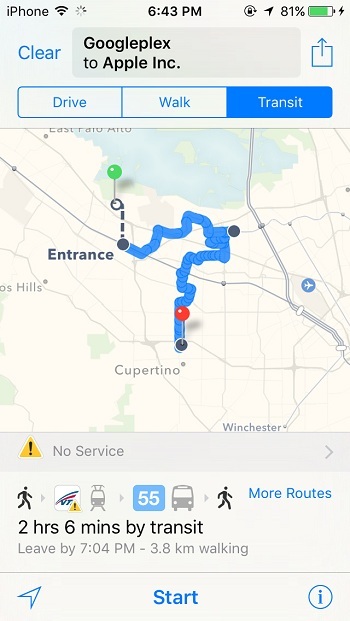 iOS 9 improved the Maps performance than iOS 8. Additionally, there is a variety of new features added to improve the efficiency. The search is enhanced with quick suggestions about nearby places. Apple also added transit information to Apple Maps. Although limited to fewer cities, it will help you navigate using public transport including, subways, buses, and even ferries. To quickly point to your favorite location, Apple Maps include shortcuts for your Home, Office and also Favourites. You can add your addresses to these shortcuts and quickly get the route to/from it. The Photos app is updated with a plethora of features that each one of you would love. It is included with a Scrubber that appears at the bottom of a photo when you open it. 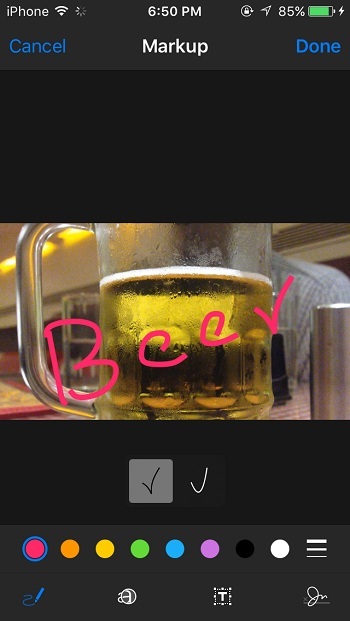 The scrubber makes it easy to flip quickly through photos in your camera roll just by sliding your finger over it. Going back to “Moments” from a photo doesn’t ask for hitting the back button. Instead, you can just swipe down the photo. Selecting multiple photos is buttery smooth now. Instead of selecting an individual photo, select one photo and slide your finger over the rest to select them all. However, if you want to eliminate any of the photos in between, you’ll have to deselect explicitly. Later you can mail all the selected photos without the restriction of 5 photos at a time. Similarly, you can also hit “Hide” option located in the Share sheet to hide your selected photos (which wasn’t possible in iOS 8). 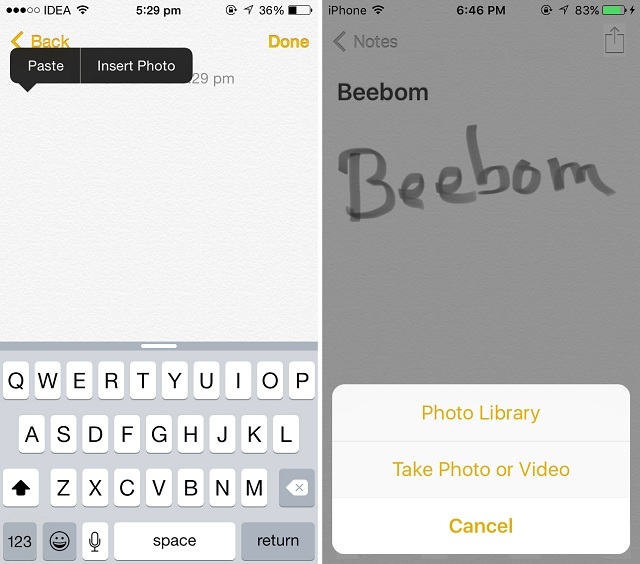 Notes app has received a massive overhaul in iOS 9. 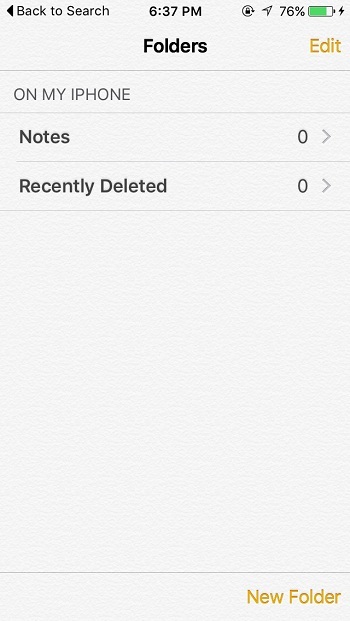 Notes app in iOS is no longer restricted to take notes alone. The Evernote killer is being offered natively on every device running iOS 9. 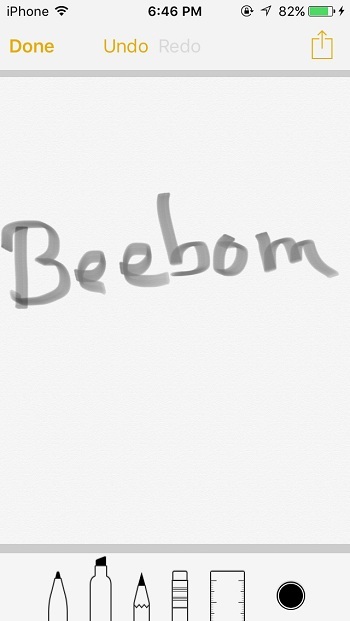 In addition to text, you can draw, scribble or write in the Notes app. Variety of tools are provided including – pen, marker, pencil, and a ruler for the same. Additionally, in the landscape mode on iPhone you get to choose a plethora of colors for your pen. There’s also an eraser tool for obvious reasons. Notes UI comes with a Camera button located at the bottom. You can use it to capture a photo directly from the camera or to select an already capture photo. Like Evernote, you can add lists to your notes as well. Notes can import links from other applications as well. In Safari, you get the “Notes” option in the Share sheet that will send the webpage URL to the note along with an icon and a title. You have the ability to choose to add the URL to an existing note or create a new note for it. Same also works in the case of Apple Maps. Overcoming the drawbacks of iOS 8, Mail app in iOS 9 brings the ability to attach not only photos but also other files using iCloud Drive. The iCloud Drive integration has paved the newest release to attach files to your mail from your iCloud Drive. While composing an email, long-pressing the mail body will show you the “Add Attachment” button that you can use to attach any file from the iCloud Drive. Saving an attachment is made easy as never before. Long-pressing the attachment will open the Share sheet where the “Save Attachment” button is located. It opens the iCloud Drive document picker where you can select the folder you want to save your attachment. iOS 9 also brings the OS X Yosemite’s Mail Drop feature to iPhone and iPad. 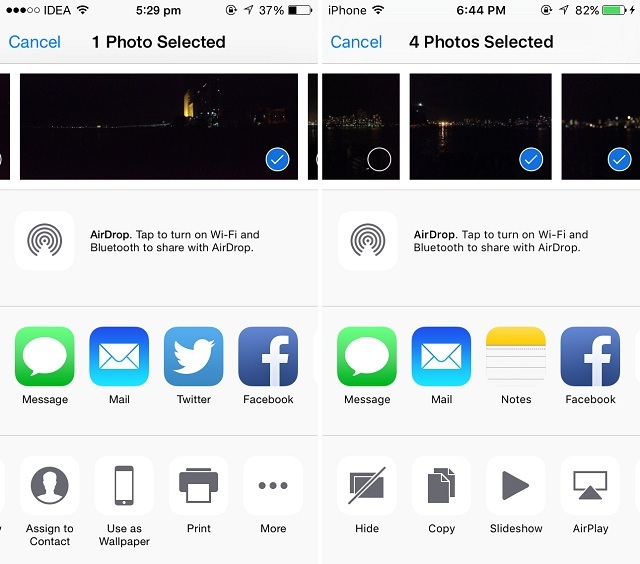 With the ability to send more than five photos through the mail (if your attachments are too big), the Mail app automatically suggests you “Use Mail Drop” option. It should be noted that Mail Drop doesn’t consume your iCloud storage. Apple has provided additional storage of 1 TB for Mail Drop. It comes with a clause that your attachments are stored only for 30 days. 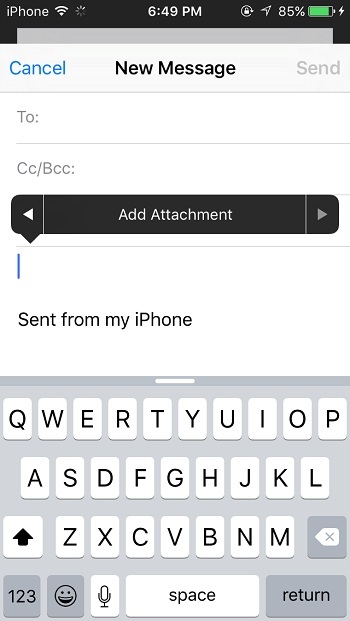 Annotating attachment is now possible in the Mail app itself. 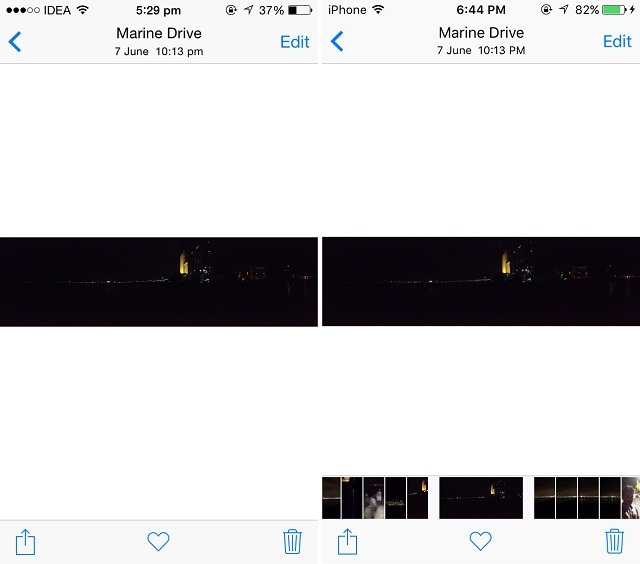 It’s similar to the markup feature in OS X Yosemite. 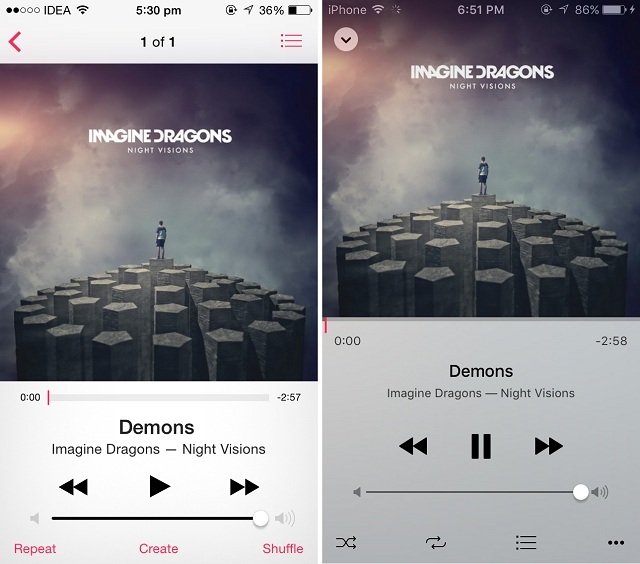 The stock music app gets a whole new look in iOS 9. 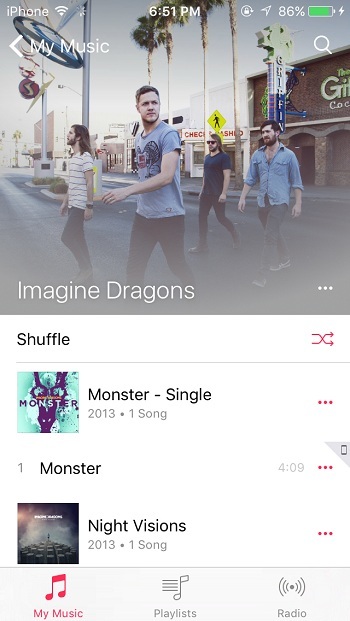 The revamped player features a neat and better looking UI than iOS 8. Borrowing some elements from the stock music player from Android, it’s enhancing the music app usage experience. 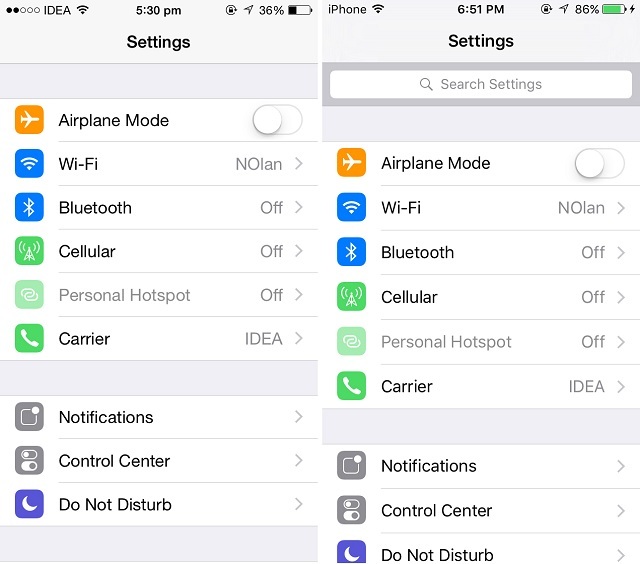 Apple adds the ability to search within the Settings app in iOS 9. The feature that made its way into Android 5.0 last year has been the most awaited feature in iOS since then. The search bar makes its place at the top in the settings app. This search bar can quit your day job to navigate through the menus and sub-menus to find a particular setting toggle. Suppose you want to turn on AssistiveTouch, then instead of navigating through General > Accessibility and scrolling down till you find the setting, you can just type “AssistiveTouch” into the search bar and get to the setting toggle right way. Battery settings get a separate standalone menu in the Settings app, eliminating its identity inside the Usage submenu. Enter Low Power Mode, the newly added power profile that reduces performance and networking activity to extend battery life. It implicitly disables all the power hungry processes including Mail fetch, Background App Refresh, motion effects and animated wallpapers. 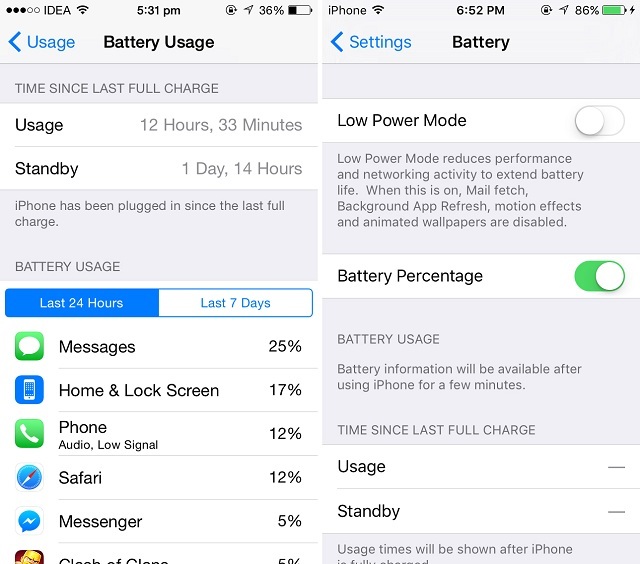 Low Power Mode is all about what user explicitly did to save his battery life in iOS 8. This mode will make it easier as you won’t have to disable every feature explicitly. The toggle for Battery Percentage is also added into the Battery settings menu. Battery usage in iOS 9 will show battery usage per app from last hour as well. iOS 8 introduced this feature with battery usage for last 24 hours and last 7 days. Additionally, it will also show how much time you’ve spent in each app. In iOS 9, Apple has set six-digit passcode pattern as the default passcode pattern for Touch ID devices (iPhone 5S, iPhone 6 and iPhone 6 Plus). For non-Touch ID devices, it uses the traditional four-digit passcode pattern. However, either type of devices can use six-digit or four-digit by tweaking manually. Camera settings are revamped with the ability to switch the video recording mode. For all the newer devices (iPhone 5S and above) the toggle for “Record Video at 60 fps” – as seen in iOS 8 – has been replaced with a submenu featuring a list of 1080p HD at 30 fps, 1080p HD at 60 fps and 720p HD at 30 fps options. The newly added 720p HD option (although useless) adds the ability to record at 720p resolution, which might come handy if you are running out of storage space. iOS 9 adds a neat way to manage your notifications. If you often get lots of notifications from different apps, you would welcome this feature. 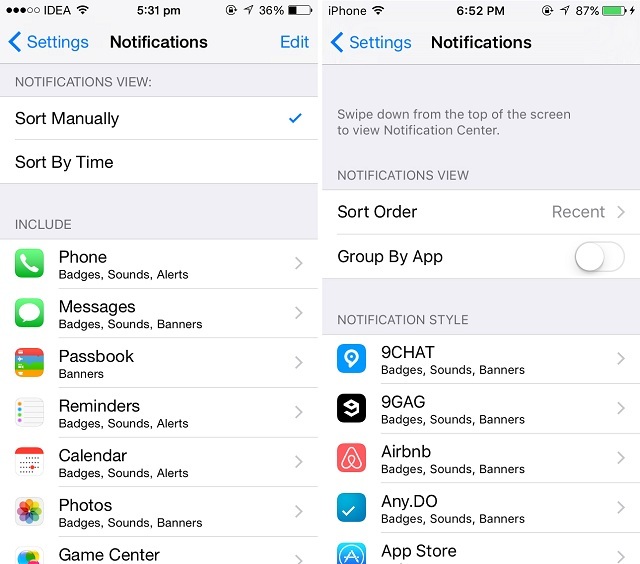 Heading over to Settings > Notifications you’ll find the way to group your notifications by app they belong to. The ability to sort by time still persists. The SIM card PIN settings option that resided in Phone menu is moved to Cellular. It makes its place along with SIM Application, the menu that offers carrier-specific applications. 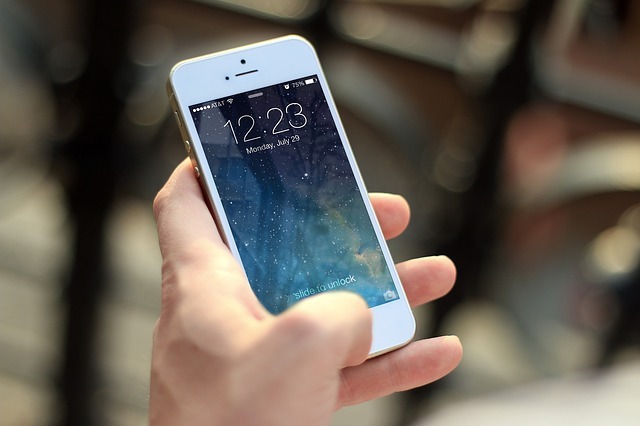 The side switch – the physical mute button located at the right side on your phone – is no longer restricted to Mute your device. 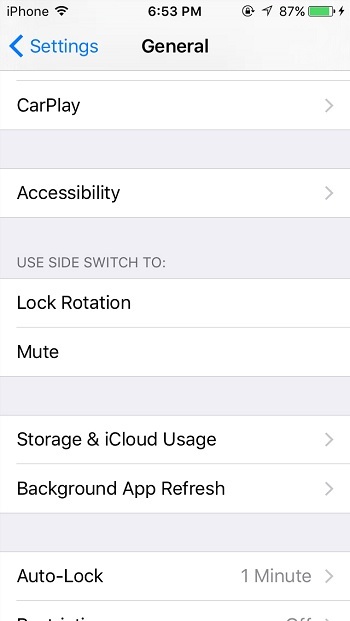 With iOS 9, you have the ability to choose the functionality of the side switch from Settings. You can now use it to lock the rotation as well. Navigate to Settings > General > Select Lock Rotation/Mute to set the function. 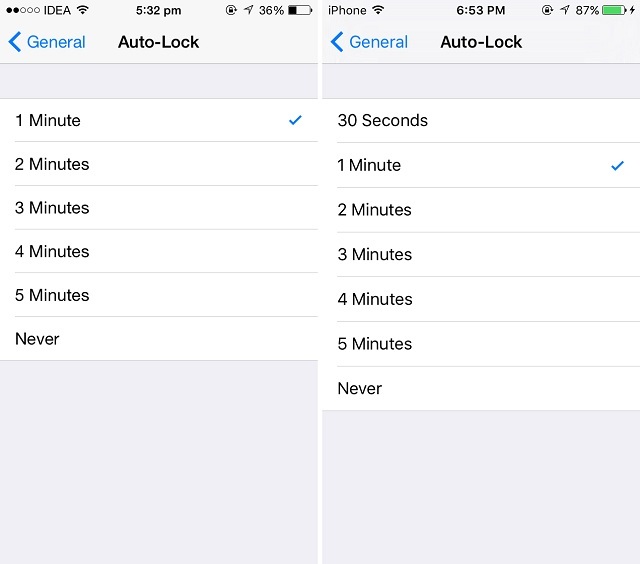 The minimum time for Auto-Lock in iOS 9 can be reduced from 1 minute to 30 seconds, which will eventually contribute to battery savings if you are onto it. 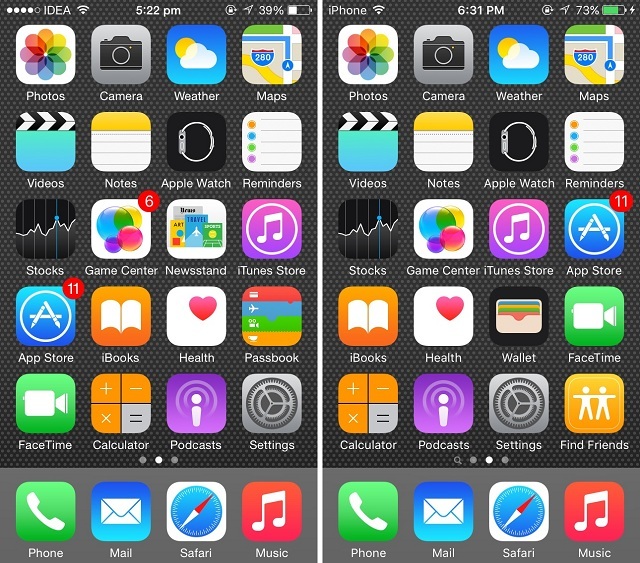 So, this was our hands on comparison of iOS 9 vs iOS 8. We hope, the article helped you learn more about iOS 9 and the features it’s coming-up with. If you have any query, feel free to ask in comments section.